In today's fast paced world, Outlook has become the most popularly used email client that facilitates with effective communication via sending and receiving emails. Along with emails, Outlook offers you with Calendar feature, which allows you to add meetings and appointments in Outlook calendar and set reminder to make you remember for the scheduled event. But, sometimes due to unknown reason you may not find your added event in the calendar entries. Are you shocked to see that calendar on Outlook is displayed with no items? Don't you remember all meetings and appointments orally? Well, do not worry!!! It is very tedious job to remember all the meeting appointments and scheduled events. All of a sudden missing of Outlook data is a clear indication of PST file corruption. When Outlook PST that saves all Outlook information gets corrupt, then all its data including your important calendar items either go missing or become inaccessible. However, one can use inbuilt utility of Microsoft Outlook i.e. Scanpst.exe to fix PST file and recover lost Outlook calendar items. But, hold on! It is strongly suggested by industry experts not use to inbox repair software as it directly works on source PST file increasing the chances of further damage. So, what can be done next? Immediately give a try for our top rated Remo Repair Outlook software that works on read only mechanism, which means that it takes a copy of corrupted / damaged PST file to repair corrupt PST file and generates healthy PST file with recovered calendar items. The application repairs PST data file very efficiently just in 4 easy 스텝s and lets you to retrieve missing calendar items quickly with great ease. 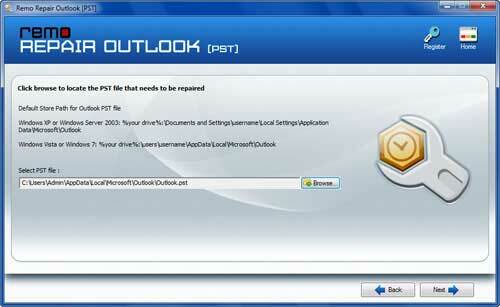 Outlook repair program is a Microsoft certified tool and greatly suggested by customers for its excellence performance. Tool is built with simple graphical user interface with descriptive 스텝s and screenshots that helps even non technical user to use software with no hassle. Supports repairing of both .pst and .ost file after corruption, damage or file gets broken. In addition to missing Outlook data, it even helps you to recover deleted Outlook emails, calendar items, contacts, tasks, etc. Helps to fix highly encrypted and password protected PST files including oversized PST file. Remo Repair Outlook is 100% free from all malignant programs such viruses / malware / spyware / adware, etc. thereby preventing your PST file from further corruption. Supported OS - Remo Outlook repair application can only run on computers installed with Windows operating system. You can fix PST file and restore all your lost calendar items on different versions of Windows OS like Windows 8.1, Windows 8, Windows 7, Vista, XP, Server 2003 and Server 2008. Supported Outlook Versions – Remo Repair Outlook software is capable enough in recovering missing calendar items in Outlook PST file created on Outlook 2013, 2010, 2007, 2003 and Outlook 2000. When you try out our trial version of Remo Repair Outlook software, you would be capable of only previewing the repaired PST file with retrieved data. Here “Save” feature will be disabled. Once you feel that this Microsoft Outlook repair program as recovered all missing calendar items, you can 스텝 forward and buy the licensed version. On purchasing the software, just repeat the 스텝s and the “Save” feature will automatically get enabled that allows you to save fixed PST file on your own desire storage location. 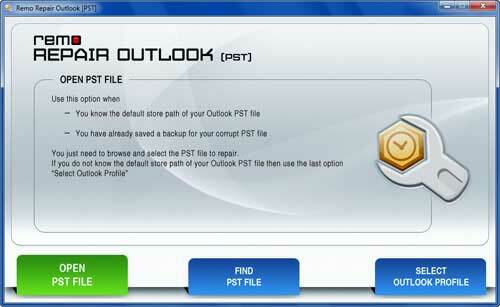 스텝 1: Download and install Outlook PST Repair software on your Windows computer. Open the tool and start the corrupted PST file repair process. Choose any of the three options from the main screen. Click on "Open PST File" option to open PST file if you know the exact PST file location. 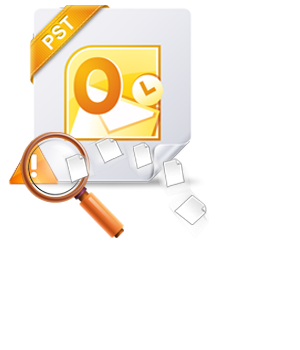 Click on "Find PST File" option to search for your corrupt / damaged PST file or choose "Select Outlook Profile" option to open the PST file if you have multiple Outlook user accounts/profiles.